I'm continuing my hole in the wall theme this week with a visit to a place I've walked by innumerable times, but never went in. I was working down by the Ferry Building recently and when lunch time rolled around, I just didn't want to deal with the lines or the high prices there, so I set out to roam a few blocks over to see if I could find a more reasonable bite to eat. 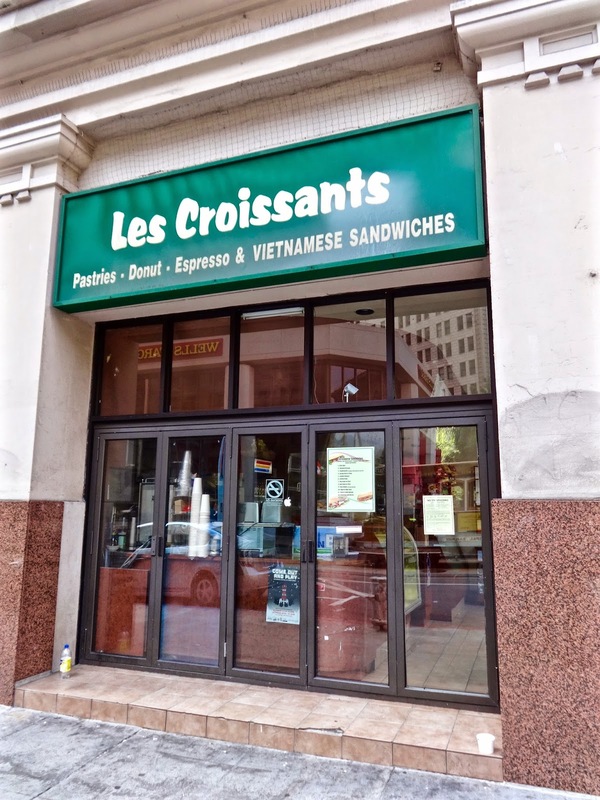 As I crossed over Drumm Street I spotted Les Croissants and thought, maybe I should just have a donut for lunch--yes I do that sometimes-don't judge me. I feel like this place has been here for as long as I've lived in this city and I've always thought of it as one of those Happy Donut alternatives if I'm ever in the hood. Though, as I said, I hadn't tried them and now seemed as good a time as any. I walked in to see what they may still have available and a handful of dudes were standing around chatting. Seems they were waiting for their Vietnamese sandwich orders, something this place evidently does a lot of. I scanned their menu and they have about 12 varieties listed, chicken, pork, veggie, etc. The guys said the sandwiches were actually good and I noticed they were all priced at $5.50. A cost that seemed right in my wheelhouse considering the size of the orders coming across the counter. Why not, I thought. I stepped up the register and ordered up a roast pork banh mi with all the fixings. A large toasted French roll with pickled daikon, carrots, cucumber, cilantro, jalapeno, mayo, a little pate spread and slabs of roast pork. Every sandwich is made to order and with only 2 ladies working in this tiny space, it takes them a few minutes to whip one out, but it was totally worth it. This is a big filling sandwich with all the flavors of traditional banh mi, just more of them. I really liked the pickled radishes, they were a nice sweet and crunchy compliment to the salty pate and pork. The meat is also tender and juicy without chunks of fat weighing it down. Just biting into it gives a great big crunch of freshness and everything comes through right down to the small pleasant kick of the peppers. 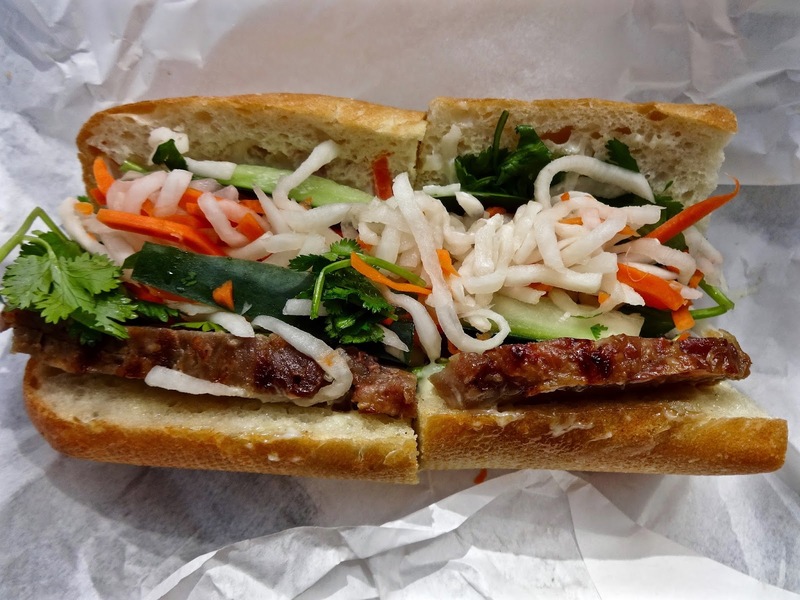 It's as big and tasty as the ones you get from Saigon Sandwich in the Tenderloin. At $2 less and with a tad more meat on the bread though, I do give the edge to Saigon if I had to choose between them. In this moment and considering my location, it tasted good and hit the spot. I even went back the next week I was working in the area and got the bbq chicken which was also just as good. I guess if you find yourself down around the Embarcadero, either working or visiting, this tiny (seriously, it really is) little spot may look like just a donut hole in the wall but they are whipping out some decently priced (for San Francisco) banh mi sandwiches, made to order and fresh tasting. I'm gonna chalk this spot up as one of those "in the know" places. It looks like one thing, but surprises you with something else. There are a lot of those kinds of places in town, which is why it is so fun just wandering around and checking things out you may have walked by a thousand times before. You just never know what your are gonna find. This restaurant looks so good! I never tried Vietnamese sandwich in my life, but now I really want to have it. I am sure I will get a delicious sandwich at famous San Francisco restaurants. I am not sure what more things I would order there.